You use the depth meter profile when snorkeling. It shows your current depth and the maximum depth you reached during a snorkeling dive. The maximum depth of the device is 32.8 ft (10m). When the depth meter profile is activated, a wave icon appears on the upper left part of the display. 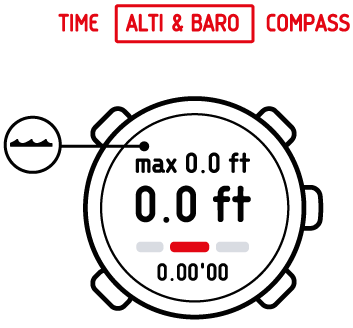 The log recorder in the depth meter profile works similarly to the log recorder in the altimeter profile, but instead of recording altitude it records the depth of your snorkeling dives. Start, stop and restart it with Start Stop. Begin a snorkeling dive. When you return to the surface, reset by holding + pressed. Do not push buttons while the device is under water. You need to reset your log recorder in the altimeter profile before using the log recorder in the depth meter profile. Otherwise, your maximum depth will stay the same as your current altitude above the surface. When you have stopped your log recorder, before resetting it, you can enter the logbook and view your current recordings!